September 28, 2016. The day that changed my life forever. The day I found out I was pregnant. It was also the day before my mom was leaving me to move to Delaware and start a new life. My boyfriend at the time took me to get a pregnancy test to be sure, but deep down inside I already knew. We both knew. I knew there was life growing inside of me. I was so scared. I thought maybe if I ignored it, it would go away. But my mother, my only support system, was leaving in less than 24 hours and I had to know for sure so I could figure out what to do. I took one test and immediately those two little lines popped up. Those two little lines so many women long for, instantly ruined my life. Or so I thought. I told my mom, and she didn't know what to say or do. I went to a friend's house and cried to her because I knew I wasn't ready to raise a baby, but I knew I didn't want to have an abortion. I was stuck. She asked me if I had considered adoption, and I hadn't; I didn't know what that meant. She gave me the number of her friend who is a social worker, and the next day I called her and we met up the following week. We sat and talked about adoption and what I wanted. I explained that I still wanted to be in my child's life if that was possible, and even be friends with the adoptive parents. She then went on to say that what I was asking for was very much possible, but that I needed to be picky when it came to who I would choose to raise my child. Hearing that made my heart full and empty at the same time. In that moment, I made my very first decision to place my child with another family. A week before Christmas, I met up with the social worker for dinner. My anxiety was racing as she showed me bios of three different families. The first two just didn't have the spark I was looking for and I was becoming discouraged. Then she showed me Tim and Ashley. As soon as I saw them, I smiled. I was so smitten with them from the moment I laid eyes on them, and my social worker knew it. I secretly think that's why she showed them to me last. I got to take all the books home and look over them by myself and make an official decision. She told me not to rush and to take my time but I had decided the moment I saw their faces. I gave her a decision before I fell asleep that night and I needed to meet them as soon as possible to see if they were the same in real life as on paper. Time started to fly by. Tim and Ashley came for dinner one night and we met at one of my favorite diners downtown. As soon as we saw each other, we knew. We hugged for what seemed like forever and it was like I was meeting family. We laughed, we cried, and we shared intimate moments of our life from before the road of adoption and during. We talked about what we hoped our relationship would look like and we talked about our boy. I knew they were meant to be his parents. I gave them a sonogram and it meant more than the world to them. That night was the start of the rest of our lives. After that, we spent more time together. Each time being sweeter than the last. We were all so in love with a baby that wasn't even born yet. I was going to the doctor twice a week because I had a high risk pregnancy. February 6, 2017 rolled around and I had yet another doctors appointment. Yet another doctor's appointment turned into the doctor inducing me. I was shocked because I thought I was going to have more time. That was the first real heartbreak that adoption gave me. That was yet another time I had to say "yes" to adoption and when I realized I have to keep saying "yes" to adoption for the rest of my life. My hospital plan and reality looked so different, but I believe it was for a reason. My plan was to have my best friend and my mom's best friend on each side of me, but actually Ashley was next to me and my mom's best friend on the other side. Ashley held my hand and encouraged me the whole time. I don't think I could have done it without her. I asked Tim to come in and cut the cord and even though I couldn't see, it was emotional. I saw pictures afterwards that Ashley took and I was in tears. It was honestly such a beautiful experience that I would do again if I had to. At 9:36pm on February 7, 2017, Maddox Moses was born at 6 pounds 3 ounces. We cried together and stared at our boy. We brought him into the world together. I breastfed and bonded with him during the day and Tim and Ashley bottle fed and kept him at night so they could also bond and I could rest. 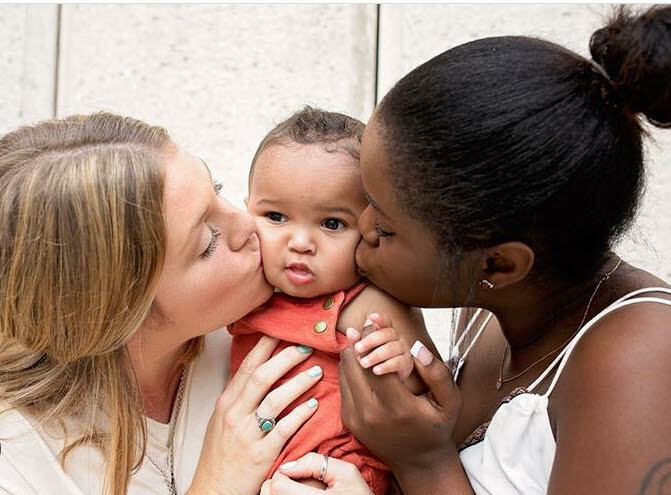 When a birth mother hands her baby to an adoptive mother, the world stops moving for a minute. It is one of the most sacred, humbling, and heartbreaking experience a person, no matter their involvement, will ever have to go through or witness. On one side it's a redeemed story and on the other, a mother's heart will never be the same. I handed my first born and most precious gift to another woman, entrusting that she will care for and love him with every fiber of her being, and I know she doesn't take that for granted. We were mourning and celebrating all in the same breath. I will never forget that night for as long as I live. The night I relinquished my rights was a very emotional day for everyone involved. I held my boy the entire time and told him how much I loved him and that I was doing what was best for him and that one day he would understand and that all of this would make sense. When I got to the last paper, I hesitated. I stared at my boy to make sure this was what really needed to be done. I was going back and forth in my head for what felt like forever, but it was only two minutes. I signed. Afterwards, Tim and Ashley came back in the room. I cried and cried and cried. I was so angry with myself for not being in a position to take care of my child. I was angry at God for giving me such a perfect gift, just for it to be taken away. In a perfect world, all children would be raised by their biological parents. Adoption is not natural. You have to sever a natural bond between mother and child. I willingly severed my bond so my baby who deserved everything and more could have the best life. Birth mamas make this decision every day. I made that decision because I trust Tim and Ashley and knew they would be the parents my we needed them to be. The first four months post-placement were rough. I had some really hard and dark days. I was questioning if I did the right thing, and then I would see them, as a family, together and I knew that they were meant to be. We never made a "contact agreement" because our relationship was effortless. We texted, called each other, and face timed whenever we wanted to. We see each other as family and family is forever. They make the effort to make sure I'm involved and that I know almost everything that is going on in his life. I was present for the adoption finalization, his first Thanksgiving, and I will be at his first birthday. I make it a point to be there so he never has to wonder about me, why I did what I did for him, or if I love him. I will be there every step of the way. Moses is about to be one year old in less than a month and we made it! We made it through the really hard and ugly parts, the awkward and heartbreaking stuff, and the down right "never want to go through this again" parts. This year was also sanctifying and intentional. I learned patience. I learned how to love someone so much more than myself. I found my faith again. I saw all the milestones and got to watch my boy grow into the funny little ham he is. I knew I would be in his life, but I never pictured it to look as beautiful as it does. In all this chaos, we found beauty. Adoption isn't sunshine and rainbows all the time. It is hard, it is work, but so worth it. You have to trust and know that everything is in His timing and that things may not always go your way and that's okay. I have found a sisterhood in birth mamas. Without Mo, I would never have met some of the most amazing people in my life that are also birth moms. They are the only people in the world who know the loss you suffer and know the whirlwind of emotions that come with this title. They never judge you if you need someone to talk to because you just had a bad day and are missing your little one. Some days are so good and some days are so bad. And they just get it. Not all birth moms are drugs addicts or have issues. That stereotype needs to be forgotten. Some mamas just aren't ready. Some birth parents just can't financially afford a baby and that's where adoptive parents come into the triad. Adoption is only a part of my identity, that's changed me for the better. I am now going back to school, I have a great job, and a great house! My sweet baby helped get me to this point and he doesn't even know it. Being a birth mama is a title I don't take lightly. I am always educating people about positive adoption language and openness. Adoption has changed so much in the last 20 years and it only becomes more normal to hear about as the years pass. My hope for adoption is that people don't jump to conclusions about birth parents and what led them to place, that it's okay, and that it's nothing to be ashamed about. One day adoption will be as "normal" of an option as parenting or abortion. My hope is that women and men everywhere choose life.